Thanks to the professional yard staff at Gloucester Marine Railways and our talented crew, Adventure safely hauled out this morning. We had to re-schedule the haul out because of heavy winds, instead of Monday the 7th we hauled on Tuesday the 8th — and what a difference a day made! While the ship is out of the water, she will get a scheduled Coast Guard credit dry-dock inspection, a fresh coat of bottom paint, new zinc anodes, and a host of regular maintenance, including caulking. In addition, we’ll be looking carefully at a couple of topsides planks that look like they might need replacement. 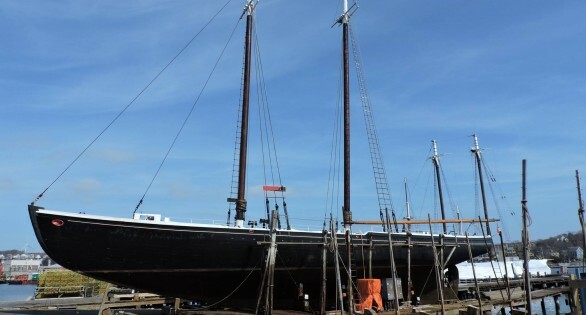 After a few weeks in the yard, we’ll be launching and beginning to fit out for this year’s sailing season!